A tasty trio for body and hands. This travel trio of our best-selling shea butters is ready to quench on the go and will impress even the finickiest skincare connoisseurs! Whoopie®! (scented like fresh-baked whoopie pies), Rainbow Road® (scented with coconut and Bartlett Pears), and Fluffy Bunny® (a light lavender mint julep) bring along decadent scents and the promise to hydrate � wherever you may be! Water/Eau, Stearic Acid, Glycerin, Glycine Soja (Soybean) Oil, Glyceryl Stearate SE, Butyrospermum Parkii (Shea Butter), Sorbitol, Cyclopentasiloxane, Theobroma Cacao (Cocoa) Butter, Simmondsia Chinensis (Jojoba) Seed Oil, Aloe Barbadensis Leaf Juice, Cucumis Sativus (Cucumber) Fruit Extract, Cetyl Alcohol, Polysorbate 80, Parfum*, Tocopheryl Acetate, Octyldodecyl Myristate, Potassium Sorbate, Phenoxyethanol, Caprylyl Glycol. I got this for my niece. She emailed me to say she loves it! She uses it and shares with her 3 year old daughter who also says she really likes it. They are deciding on which scent they want for a full size gift! These skin creams have wonderful aromas and all are also gentle and effective. My favorite is Fluffy Bunny. 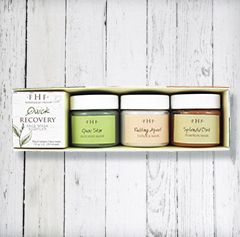 This is a great sampler set. It could be broken up and used with other small items to make a mini gift basket. All the smells are truly amazing. 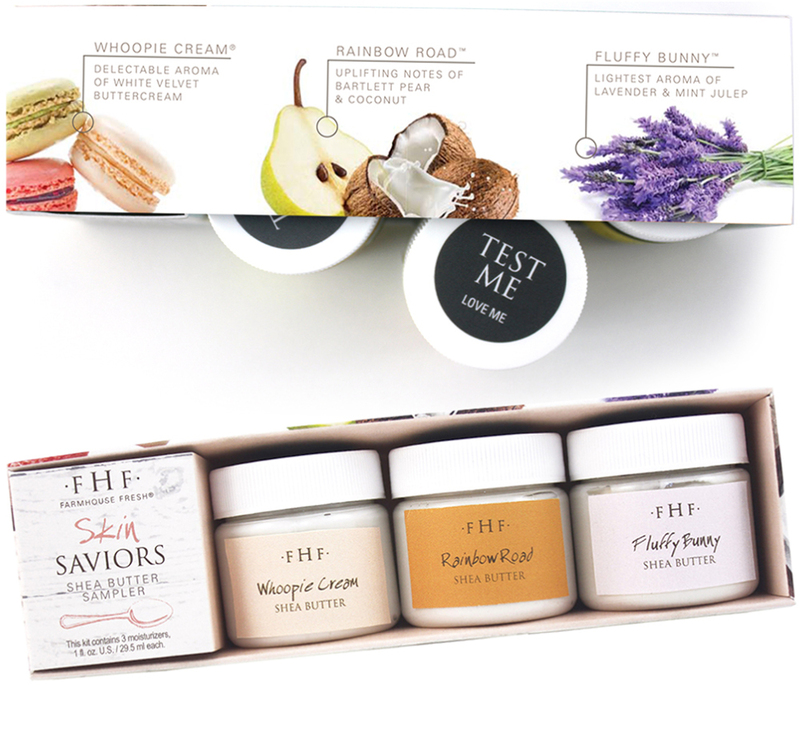 This sampler was a gift to a good friend introducing her to FHF products. Fluffy Bunny is by far both of our favorite followed by Rainbow Road which has a pleasant smell but just doesn't quite compare to the excellence that is Fluffy Bunny. Whoopie is good too, smells exactly like whip cream to us. Really great gift item! I am very, very picky when it come to my products that I choose for my skin so I immediately was hesitant to try a new product. I am SO, SO HAPPY that I did! I have really sensitive, very soft skin and I can only use CLEAN products. THIS company is FRESH, CLEAN AND the BEST. Smells yummy too.. eat before shopping!